So its getting to the end of summer and although its still warm here in the uk my thoughts are turning to the fall and a harsh winter again like we had last year. 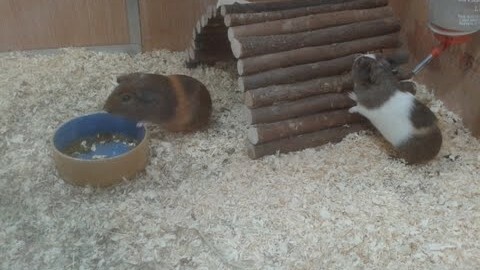 It got very very cold here in England and not a good place to have a cavy. I really don’t want to kill it off and want it to get through winter the best way I can make it for them. This being the first winter of cavy ownership, im investigating the best ways to prepare my guinea pig for a winter in the uk. From research and talking to experts there are three possible solutions to this. There seems to be a lot of opinion on what is the best option and so I have broken down the 3 methods of Guinea pig winter care, so they can be considered better. If you can bring them inside this is the best thing to ensure that they are ok.
Get them a run or guinea proof a room so they can get some exercise every day rather than being kept in their cage. They can then spend more time with you and your family and feel part of the household. If you can’t bring the hutch inside, then you can buy indoor cages that can be kept on a table or sideboard, they do vary in size though and obviously the bigger the cage the better for the guinea pig. But they will give your guinea pig some protection from the cold. If you really can’t bring them inside then a shed or another outbuilding is the next best thing and will give them good protection from the elements. Make sure that they have access to natural light and that they have a pleasant environment to breathe. This means keeping away from dangerous fumes. They need warm, dry draghtproof accommodation. A bed with cosy shredded paper or straw. Don’t leave them and abandon them over the winter time. They need lots of attention, cuddles and snuggles over this time. Affection is highly apprecitated by piggies. Insulating a hutch can be done in the following ways. using a piece of carpet or blanket or cardboard covered by a piece of waterproof tarpaulin can be sufficient. You can also buy hutch covers from pet stores to cover your hutch. They are great for protecting against the elements but are not so good at heat insulation. So you would need something to insulate underneath. Make sure you bring them inside on a daily basis if you can so they can get some time with you and your family. Experts say 2 hours a day is what we should be aiming for, but any amount of time you can give them will be appreciated. Its important to keep close to your guinea pig during winter time, so lots of cuddles and snuggles are great for it to feel wanted loved. It will really appreciate being part of the family which is why bringing it inside the home is the much preferred option. Another thing that I will investigate is bedding. You can get igloos or pet shelters from pet stores that your guinea pig can bed down in. this is much the preferred option to sticking a load of hay down and expecting the guinea pig to keep warm in it. When you lay hay down it attracts mites and disease and the guinea pig will often just trample it down. It is better to put hay into a rack of a wire container to stop them from lying in it. This means that they can have good access to the timothy hay when they want it. They can also be washed easily. Get a good stock of food in, including vitamin c pellets, timothy hay, and ensuring they have a good supply of water to keep them well hydrated. If you are looking for further reading on the subject then the good people of Cavy heaven have produced a good pdf on the subject which is well worth a look. How have you found keeping piggies over winter time? Is there anything that I’ve missed that could be useful? Would be great to hear from you in the comments. Hi I have two piggies would it be ok to use a heat lamp for small animals be ok to use in our garage where I keep them over winter. You would need to insulate the hutch for your piggies and give them plenty of bedding to keep them warm,if you really can’t bring them in. my guinea pig has been outside from summer to now .. is it okay for me to bring him in over winter, then put him back out in a few months ?